Having plants at home is a fun and rewarding experience. You get to enjoy the companionship of nature being at home, and depending upon what kind of plants you have grown, each has a different kind of persona – some are decorative, some are perennial, some are seasonal, some give flowers, some give fruits and so on. No matter, what their personality is, every plant in your house is special to you and you always find each of them amazing. You should return the love you are given by providing your plants with proper care. Taking care of plants gives an amusing feeling, yet it is a little hard because of the responsibilities involved. However, you would not mind doing few extra chores for your green best friends. Healthy soil: Healthy soil is one of the most vital requirements of every plant. It contains essential nutrients from organic matter to micro-organisms. Soil acts as backbone for plant roots and helps support the plant to stand. Fresh and clean air: Fresh and clean air is a must for healthy growing plants. If air is polluted due to any reason, be it smoke, gases or other pollutants, it will harm your plants, limiting their ability to inhale carbon dioxide for making their food by the process of photosynthesis. Water: It is important to water your plants when you see the soil is dry. Water is taken up through the roots from the soil. Plants use this water to carry moisture and nutrients back and forth between the roots and leaves. Water should be given in moderate quantity as per the requirement of your plants. Too little or too much water can be harmful. Nutrients: Nitrogen, phosphorus and potassium are the most important nutrients for plants to grow well. Phosphorus is required to make the flowers bloom to their best and strengthen the roots. Potassium boosts the immunity of plants by helping them fight of diseases. Nitrogen helps to keep the leaves lush green. Organic matter and fertilizers provide plants with nutrients. They are generally given while watering them. Adequate sunlight: All plants need sunlight for making their food (photosynthesis). If they are not given adequate sunlight, they will become weak and have fewer flowers, less fruits and dull leaves. As a whole they will start giving a gangly look. Appropriate temperature: Every plant endures and flourishes in a particular temperature. It may burn in too hot and freeze in too cold temperature. Know your plant’s requirement regarding right temperature and provide it with the same to the best possible extent. Proper space: Plants need room to grow and flourish. Both the roots and foliage need enough space to enjoy a good air flow and sunlight. Overcrowding of plants or not providing them enough space will restrict their growth and increase the chances of suffering from disease. These are the ways to show your love and care towards your plants. Though nurturing them can be little exhausting but at the same time it is a great joy too. 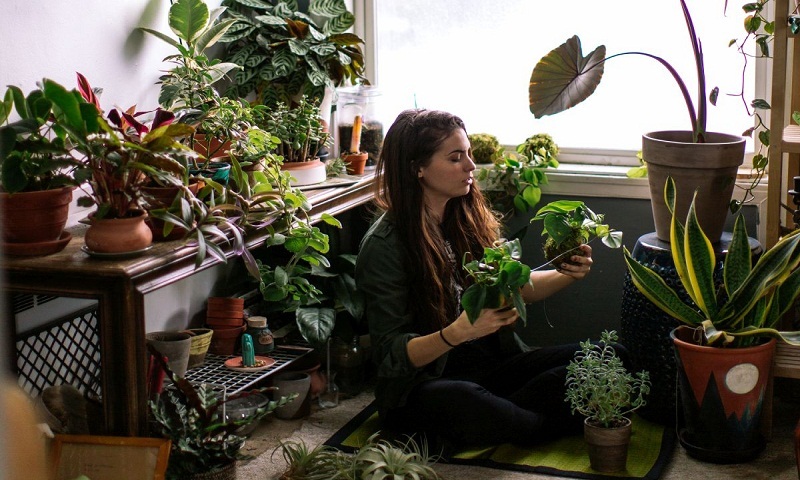 When you are aware of your plants’ needs of water, air, soil, sunlight, nutrients, temperature and space, you will create a great relationship with them. No matter what kind of plants you have grown in your house, taking care of them is an important part letting them know you love them.